Our trusted Manong Tricycle Driver dropped us off in front of Balinsasayaw when we asked him for a recommendation of a good place to have an early lunch before we embark on a journey with him to Honda Bay. He was to pick us up at 1:00. The place was smoking literally and we were not so crazy about neither barbecue nor having smoky smell during that moment so we looked around for a different kind of lunch. And there across the back side of the Pasalubong Center we spotted a funky orange carinderia. 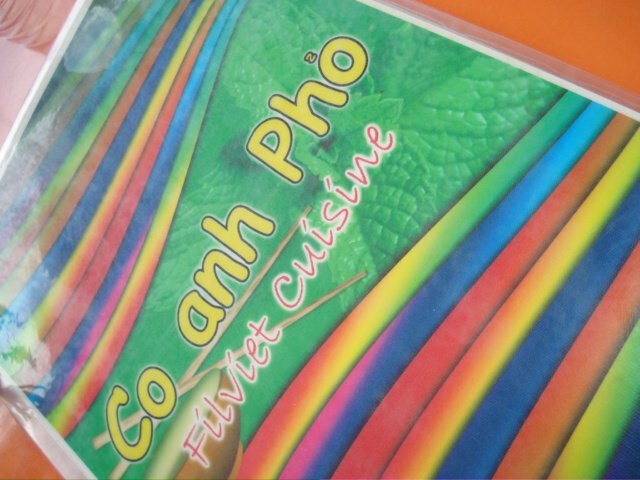 I read from the many articles I’ve managed to bookmark during the months of research about Puerto Princesa that the city has a tinge of Vietnam especially in terms of food. I was looking forward to having a taste of banh mi (French bread with a special filling) in Viet Ville. I sampled the bread when a friend brought home some from her Vietnam trip. It was good! But Viet Ville wasn’t in our itinerary because it was simply not worth our collective while, so this simple carinderia should be fine. I asked if they have banh mi after spotting the baskets of French breads at the counter. Ate said they have but upon seeing the menu, what they had was bam-i. Hindi ba pansit ‘yun ng Thailand? Anyway, it turned out that you can choose how you want your French bread done. We just opted to have them plain, thinking about the fishes at the Honda Bay trip later. I did not ask again if they have the sandwich I was craving for baka kasi dumayo pa sa Viet Ville, kung saan man ‘yun, ang very accommodating na Ate. Tofu salad, or at least what's left of it. Yummy! The tofu pieces (not in picture, already devoured) are full of flavor. We ordered tofu salad and the guys also had, hmm… forgettable orders. Hehe Basta, meat with rice meals ‘yun. We were the only customers at that time and our orders took a while to be cooked and so when the tofu salad arrived at our table, we wolfed it down and forgot to take a picture of it. The tofu pieces were very tasty. They must have soaked it after frying. It was heavenly. An interesting flavor literally burst with every bite of the tofu. The dressing, which was a bit sour, blended well with the tofu flavor. The sprouts look odd, though, they were longer than what we expect them to be. Because we were such good friends, I got to taste the food they ordered and because the bam-i (which was my pick despite the fact that it was really a Thai food, but, heck, it sounded like bahn-mi, pwede na ‘yan!) hadn’t got into our table yet. But then as I’ve said they were forgettable (and we also forgot to take pictures of them) so I can’t elaborate about how they tasted here. They were very good, that’s for sure, because we are a bunch of easy to please customers, aren’t we, guys? Again, what's left of the Bam-i. The bam-i arrived and capped off our sumptuous early lunch, and it did so very well. 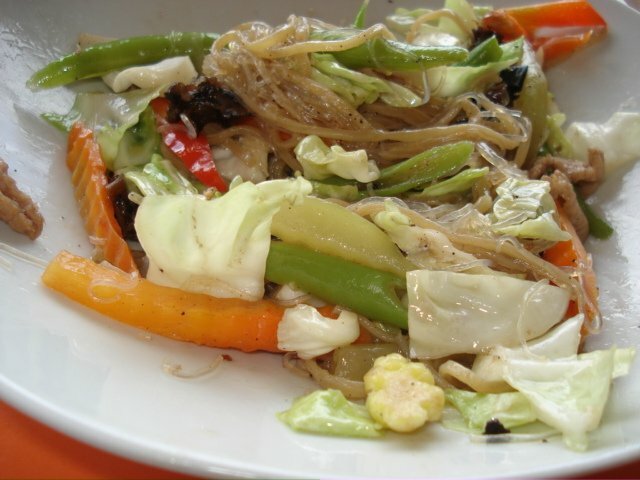 It was a splendid dish for a carinderia that described their dish as “para pong pansit canton“. The flavor was just right, not too salty like most bam-i I had in the past. The veggies were fresh, too! I liked that it had a lot of veggies. At this point we ordered French breads because they were just perfect for each other. Naks! But we were so full that we didn’t finish the plate. And that’s when we remembered to take a photo of it. I know this is a bad review for a food place. I forgot to take note of the names of the other dishes, we forgot to take pictures and most especially, I forgot the price of each dish that we ordered. 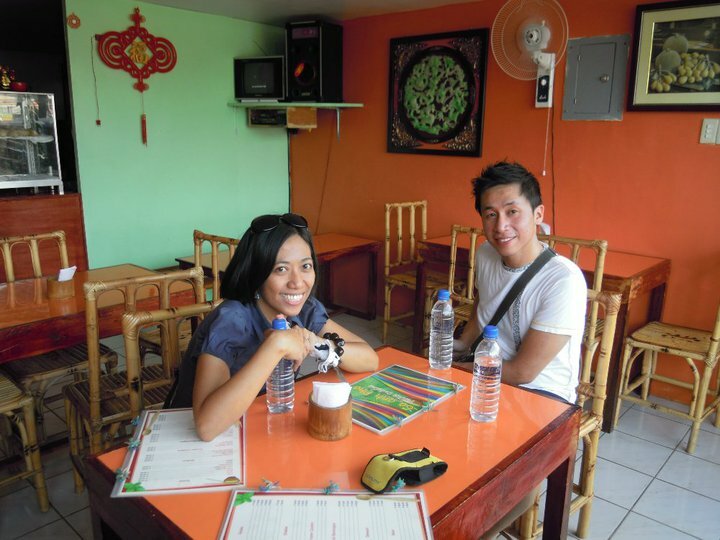 However, I still remember that we only paid more or less Php300 for the lunch. That was a sweet deal for people like us, who appreciate cheap good food just because we’re from Manila, where everything seems so expensive. 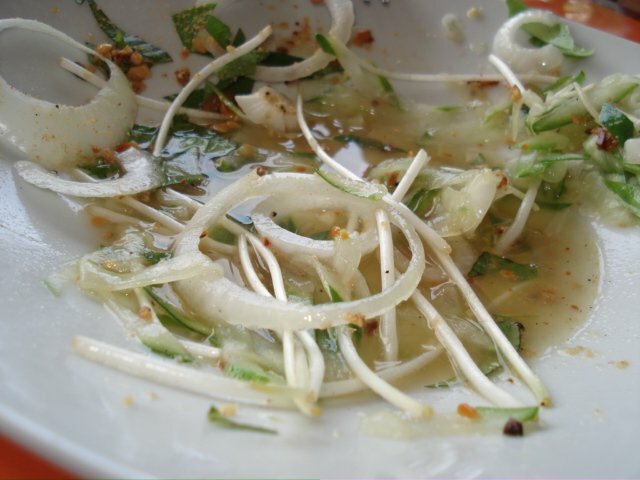 This entry was posted in Vittles and Victuals and tagged bahn mi, bam-i, Co Anh Pho, fil-viet, filipino dish, food, Palawan, Puerto Princesa, vietnamese dish. Bookmark the permalink. ← It’s Honda Bay, Baby!